Whatever your pre-conceptions, or even misconceptions, of Mind Mapping, it is now becoming truly embedded as a real value-adding approach in many aspects of planning and working throughout the business and education sectors. The added power of mind mapping software such as MindGenius has propelled this methodology into the all-important efficiency and productivity arenas. • Have better focus and clarity on all tasks, activities, plans, strategies, projects, etc. and much more….. There are many wide and varied uses, applications, not to mention tangible benefits and productivity gains to be realised from the application of mind mapping in a business context. Mind Mapping enables you to quickly capture and visualize the various strands of your Plan. The parent / child Branch relationships, together with the “drill-down” methodology, provides a visual and highly effective methodology for dividing topics, layering each level of detail, ordering or grouping and getting structure and hierarchy in terms of analysing the information. The engaging and visual process of Mapping provides structure, flow and aids clarity and understanding of the captured information (as a whole or in its component parts). MindGenius provides the substantial additional benefit of being able to Categorise and Filter for parameters such as Priorities, Importance, Risk, etc, as well as being able to apply Resources and Timescales – all improving the time and effort spent trying to understand and analyse the information and introducing more momentum and efficiency to moving through the whole “plan/analyse/decide/do” process. This methodology can be applied to any personal, business or strategic planning, objective setting, research, analysis of information/data, “to-do” lists, as well as many uses in education and learning. One of the major strengths of using Mind Mapping for capturing knowledge and information around any given topic is the clarity and focus that the capture and visualisation interface provides. The Mind Mapping methodology provides structure, linkages, relationships, as well as the ability to tackle the initial capture stage from a “blank sheet” perspective, or map out a skeleton structure to guide the process. Maps are a great way to read, assimilate and gain understanding on a range of topics, plans, problems, projects, research work, learning and revision, etc. Mapping also helps with reducing “information overload” that sometimes gets in the way of understanding, decision-making and generally moving forward. 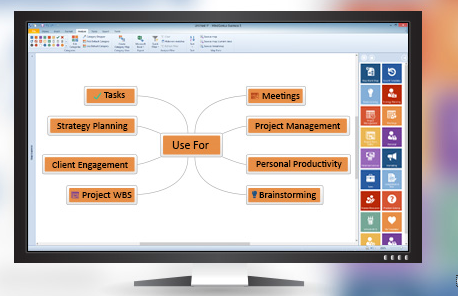 The added value and benefit of utilising MindGenius software includes the ability to add Notes to branches; link to documents and URLs; Navigate large maps easily with Map Explorer; Categorise branches to aid decision making, analysis and prioritisation; Filtering; Export to MS Office applications, etc. The mapping methodology really excels at the crucial “front-end” Planning stage of Project Management – providing an ideal format and layout for capturing the hierarchy, structure and order of all tasks and activities that form the project requirements or “Work Breakdown Structure”. MindGenius software provides the platform to go further than Planning, providing the functionality to Schedule, Monitor, Manage and Report. It enables you to brainstorm the project requirements in a highly engaging and visual way. The integral Gantt functionality (or export to MS Project) provides the easy and intuitive format to allocate Resources, Start Dates, Durations, End Dates, Interdependencies, Constraints, etc. Built-in Filtering, export and significant reporting capability provides further efficiency, visibility and management capability to monitor and manage through the whole project lifecycle. Bringing clarity and focus to meetings, discussions or any other situation where the “What / Who / When” needs to be clear, well-defined and communicated – that’s where the use of mind mapping really does add value. Easily and quickly mapping out the Actions, assigning ownership and committing to timescales / deadlines, all contributing to a visual representation of agreed actions and outcomes. MindGenius allows quick and easy mapping of Actions and then the dynamic application of Resources and Due Dates. The further advantage of being able to communicate Tasks through , for example, the synchronisation with MS Outlook, combined with Filtering capability for Resources and Dates, provide a truly beneficial method for agreeing, allocating and managing Tasks – another example of a more efficient and productive way of working. Mind Mapping enables not only the effective, visual way of capturing ideas, knowledge and information, but also to create structure, hierarchy and order – particularly useful if you need to get to a point of identifying priorities or needing to arrive at well-informed decisions. Again the visual aspect is a huge benefit, as is the breakdown and drill-down effect that aids understanding and negates potential “information overload”. The usefulness and efficiency that the use of Map structuring, navigation, Categories, Filters, etc, brings via the application of MindGenius further improves and enhances the whole process. It also provides a vehicle for communicating and presenting the actual “information journey” as well as the outcomes with clarity and focus. Again, mapping brings more clarity and focus to each stage of the effective meeting process – from planning, the actual meeting itself, on to assigning priorities, actions and timescales and through to monitoring and managing agreed outcomes and actions to completion. MindGenius software provides the intuitive and easy-to-use interface to map and manage the whole end-to-end meeting management process – the purpose/objectives, planning, execution stage, follow-up and close out. This is achieved through: easy and quick capturing of all information; sorting and grouping for hierarchy, structure and related topics; Categories and Filtering as/if required for priorities, decisions; allocation of Resources for Task ownership; allocation of Due Dates; Task status and progress monitoring; synchronisation with MS Outlook; and many more ways to simplify and provide clarity and focus at all stages – a really visual and productive way of working! If you haven’t already done so, please take a serious look at using MindGenius for any or all of the above situations in your day-to-day work. If you require help or assistance there are numerous resources both within the MindGenius Help and within the Resources section of our website www.mindgenius.com. We also provide advice and professional training and consultancy services to help you get the most out of MindGenius and its application for many business and education uses. Contact us anytime on info@mindgenius.com, we’d be delighted to help! This “How To” guide outlines how you can apply pre-defined Filters for Tasks and Categories via the “Analyze” and “Task” Ribbons. Maps can be filtered based on properties assigned to Branches, such as Action attributes, Resources, Categories, etc. Quick Filters are available in two locations: The Analyze Ribbon and the Task Ribbon. How best can I use the Quick Filters? The Analyze Tab allows you to Categorise branches. Subsequently, the Quick Filters available via the Analyze Ribbon allow you to filter for Branches with certain Categories assigned. • Branches that do not contain your selected Category will be greyed-out. (You can select “Hide Non-Matches”). Note: The list of Categories displayed when you open the Quick Filter is “dynamic” i.e. it is based on Categories assigned in the Map. You must add Categories to the Map before the list will contain any. The Tasks Tab allows you to assign Actions to Branches. Subsequently, the Quick Filters available via the Tasks Ribbon allow you to Filter for Branches meeting certain Action criteria. • Branches that do not pass your selected Filter will be greyed-out. (You can select “Hide Non-Matches”). At MindGenius we could easily just sell you a software package, leave you to it and hope that you start using it to take advantage of its functions and features as soon as possible. However, with many years of experience with a diverse range of global customers, we believe that proper adoption of MindGenius is mainly about users fully understanding and appreciating what MindGenius is all about and how to apply it in their day-to-day activities to enhance their productivity and efficiency. Proper adoption is the only way that ensures individuals and organisations are getting the most out of MindGenius and are therefore accruing meaningful productivity benefits and tangible ROI. Having successfully helped thousands of individual, teams and organisations around the world successfully adopt MindGenius, we have the experience, knowledge, expertise and a range of resources to help you do the same. We offer a range of client development services to support MindGenius users in the use and adoption of MindGenius. We provide a range of online and onsite training offerings and consultancy assignments. We can tailor any training or consultancy packages to your specific requirements. • Have you activated your MindGenius licences yet? • Are all your licences allocated and in proper use? • Can you and/or your MindGenius users apply MindGenius effectively in your day-to-day activities and tasks? • Are you realising the full benefits of MindGenius as a productivity tool and getting optimum ROI? If you feel you, your team, or other MindGenius users could do with a helping hand to get more out of MindGenius and get better users truly adopting MindGenius as a productivity tool, simply contact us at info@mindgenius.com to arrange a call to discuss your requirements.